‘Tradescants’ Orchard’ – who painted the pictures? ‘Tradescants’ Orchard’ is the name given to a leather bound volume of over 60 water-colours of varieties of different fruits painted in the 17th century and held in the Bodleian Library, Oxford. 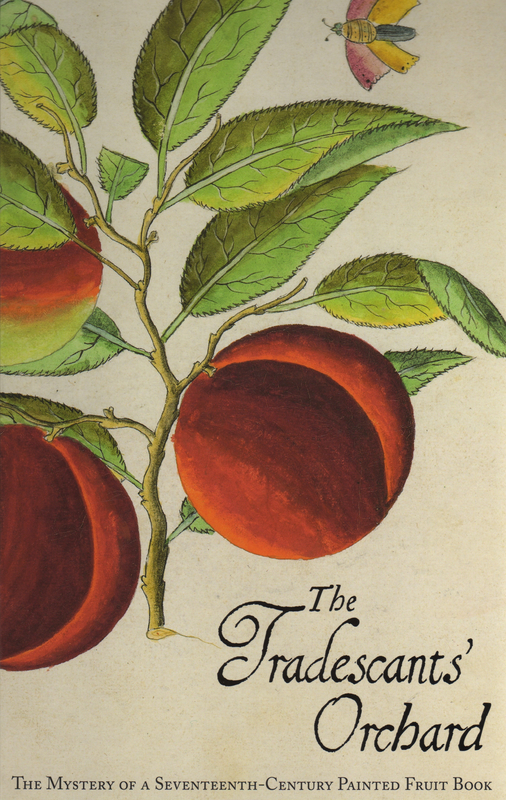 These pictures, which are often seen reproduced on postcards, notelets and so on published by the Bodleian, were the subject of a book in 2013 by Dr. Barrie Juniper and Dr. Hanneke Grootenboer: Tradescants’ Orchard, the Mystery of a Seventeenth–Century Fruit Book (reviewed on our main website ). The authors explored many avenues of investigation in pursuit of the origin and purpose of the paintings, but the most intriguing question remained – who was responsible for painting the fruit pictures? Now, Dr. Juliet Ralph of the Bodleian and Dr. Juniper believe they have solved the mystery and their findings were published in a recent issue of Oxford Today (Vol 27, No 2, 2015). First, let us go over a little of the background to this volume of paintings and the details published in Juniper and Grootenboer’s book: in about 1680 the water-colours were brought together and bound or rebound with a contents page written and inserted by Elias Ashmole, a scholar and wealthy collector. He owned the paintings in 1678. Earlier he had described them as ‘A Book of Fruit Trees with their Fruits, drawn in Colours about the year 1640. Fol. 1461’. Ashmole donated the bound volume of paintings to the University of Oxford and it was placed in the Ashmolean Museum, passing to the Bodleian Library in 1860, when it received the name ‘Tradescants’ Orchard’. The watercolours may have belonged to the Tradescant family, but their origins are far from clear. John Tradescant and his son, also John, were gardeners to the aristocracy and plant collectors, who established a nursery at Lambeth in South London. They also built up a ‘Cabinet of Curiosities’, a collection of natural history objects, coins and other items, which Ashmole acquired and gave to Oxford University; in many ways it founded the Museum that bears Ashmole’s name. In the Oxford Today article, Ralph and Juniper suggest that the artist responsible for the water-colours was Hester Pooks or Pookes, who became the second wife of John Tradescant junior in 1638. The evidence is circumstantial, though nonetheless persuasive. Hester was part Dutch by birth, related to distinguished Dutch artists, the De Critz and De Neve families; a member of the former was a royal portrait painter. Indeed, Hester’s Dutch relations made several portraits of the Tradescant family, although only after her arrival. The arguments in favour of Hester as the artist are that she was brought up in a world of painters, could have watched them at work, even received some lessons. When she moved to London, she was in a position to persuade her relatives to bring across the good quality paper that was used, as well as brushes and paints. The water-colours that she may have painted, however, were naïve, simple drawings and child-like in their execution compared with the work of contemporaries abroad and of artists in England. Hester’s water-colours, if she was the artist, include pictures of birds, butterflies and animals. This combination of fruit with its leaves and insects and other creatures often featured in still-life paintings and she may have painted them for her own pleasure or to decorate her home. But the paintings show signs of a good deal of handling, which led Juniper and Grootenboer to propose that they functioned as an illustrated catalogue, which the Tradescants showed to customers to tempt them to buy fruit trees. Yet, as the authors point out, if this was their purpose the present collection of water colours must surely be incomplete, since it has very few paintings of the most popular tree fruits of the time – only one variety of apple and merely four of the pear. Furthermore, these paintings were made some time before, as far as I am aware, the first known example of an illustrated fruit list – the famous Furber’s Fruits published in 1732 by this Kensington Nurseryman to promote his stocks. The nature and style of the paintings, Ralph and Juniper find, resembles another form of domestic art, that of embroidery and, particularly, the uniquely English ‘stump-work’ or embossed, raised work made by padding out the images. At this time, needlework was an appropriate occupation for girls and women in the home, who might create embroidered pictures, frames for mirrors and covers for boxes. To inspire and guide the embroiderer, pattern books were published and needlework kits sold. Flowers, fruits, leaves, tiny insects and animals, depicted with a simple almost folk-art quality, are among the motifs found in needlework of this period. Perhaps, these fruit water-colours were designs and templates for Hester’s embroidery. She may have copied the outlines of the design and transferred these to her material, often satin in stumpwork, and then used the colours of the painting to select the right silks to create her embroidered composition. One can image a plump peach or a luscious bunch of grapes with a curious little lizard alongside lending itself to an embossed needlework picture. Hester could have shared or lent her paintings to other ladies to copy. This might account for the marks of handling seen on the original paintings. All we need now is some matching embroidery! Was there anything resembling an embroidered picture or trinket box among the objects that Ashmole gave to the Museum?